"In God's name, the counsel of our Lord is safer and wiser than yours. You have thought to deceive me, and you deceive yourself still more; for I bring you better succor than ever came to any knight or city whatever, seeing that it is the succor of the King of Heaven. Nevertheless, it comes to you not through love of me; it proceeds from God himself, who at the request of Saint Louis and Saint Charlemagne, has had pity for the city of Orleans, and has not wished that the enemy should at the same time possess the person the duke and his city." 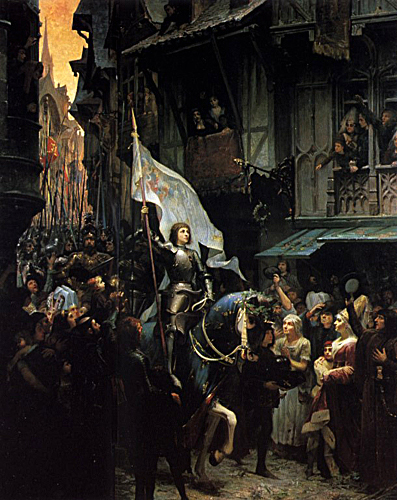 "And she crossed the river Loire with La Hire and myself, and we entered all together the town of Orleans. These are the reasons why I think that Joan, and all her deeds in war and in battle, were rather God's work than man's: the sudden changing of the wind, I mean, after she had spoken, which gave hope of aid, and the bringing in of the provisions in spite of the English, who were much stronger than the royal army, and the fact, furthermore, that this young girl swore that she had had a vision in which Saint Louis and Saint Charlemagne prayed to God for the safety of the King and of this city."